A short while ago Neil posted here about the way RepRap 3D print quality is starting to knock spots off the proprietary competition. 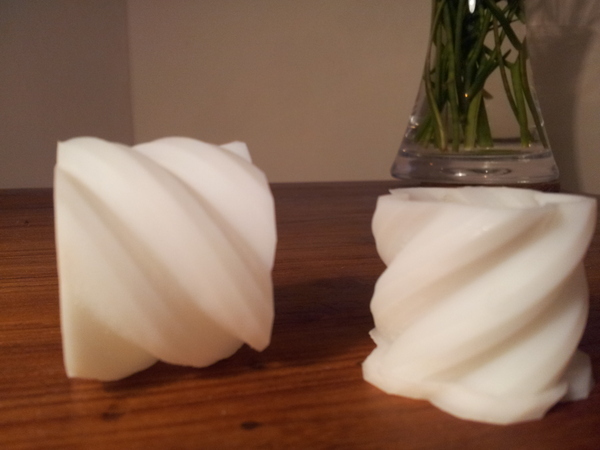 Jean-Marc just printed Misguided's Screw Cup from Thingiverse (above) on one of our RepRapPro Huxleys in ABS. We used a non-standard 0.3mm nozzle (standard is 0.5mm) and a layer height of 0.1mm. It took a while under those conditions, of course - 5 hours. 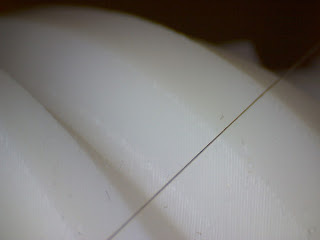 The line is a 60-micron human hair (selflessly donated by Christine Bowyer under only mild protest; as those aware of my appearance will know, I am incapable of providing such a sample myself). While multi-material printing is what I'm holding my breath for, I have to admit this is impressive. I have to ask something, though... Do you foresee similar improvements in print time? 5 hours for a shotglass sounds painful if you need something sizable quick or want to mass-produce anything. I ask this from the perspective of someone who has no experience in 3D printing, but has been loosely following the development and might get into it in a couple of years once the technology is more versatile. Yes - I do see a massive improvement in time. We weren't concerned about that for this experiment, which we did in the simplest reliable way - the entire thing was printed at 100 microns layer height. But I am also working on microlayering in the RepRap Java Host Software. This will be much more subtle. Specifically, it does the outlines microlayered, then every few microlayered outlines it does a full-height infill (the quality of which is OK, but more importantly is irrelevant for surface quality). This all goes at only slightly slower speed than not using microlayering at all. It works really well in conjunction with the new CSG (i.e. bypassing STL files) object description in the Java Host, too. But shifting paradigms is the best way to innovate! ...and since you brought it up, congratulations on reaching your funding goal! Yes well done on hitting the target.. Does anyone know the extruder and hot end type used for this? Hey, congratulations for the print qualtity, really impressive. Did you used Standard 1.8 degree stepper motors with 16 microsteps? And did you cooled the ABS with a fan? By the way microlayering would ne awesome!